Cook only joined Glasgow recently but blasted to victory after a tough qualifying route. Tigers ace Kyle Howarth finished on the rostrum after a strong display to go straight into the final. In one of the best meetings seen at Owlerton all season, riders were brushing handlebars as they battled for a top six spot to keep their interest alive in the race for the title. 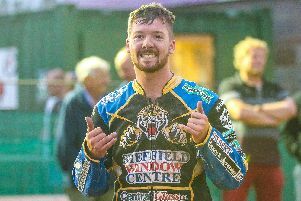 Former Tigers ace Ty Proctor was involved in some of the most exciting racing and just about did enough to make the semi-final. Charles Wright was equally entertaining but, like Proctor, missed out on a place in the final when he trailed in third in the semi-final. Howarth said: “I thought I was in with a great chance of winning the title but it just wasn’t to be. “I worked hard but didn’t quite have enough in the end and it’s disappointing but to get third place overall isn’t too bad. “Congratulations to Craig, he’s done a great job and I’m pleased for him but I’m slightly disappointed for myself. 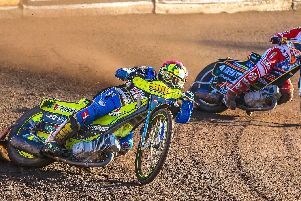 Sheffield officially end their season at Redcar on Friday in Championship action and club bosses have already confirmed they have riders in mind for next year.